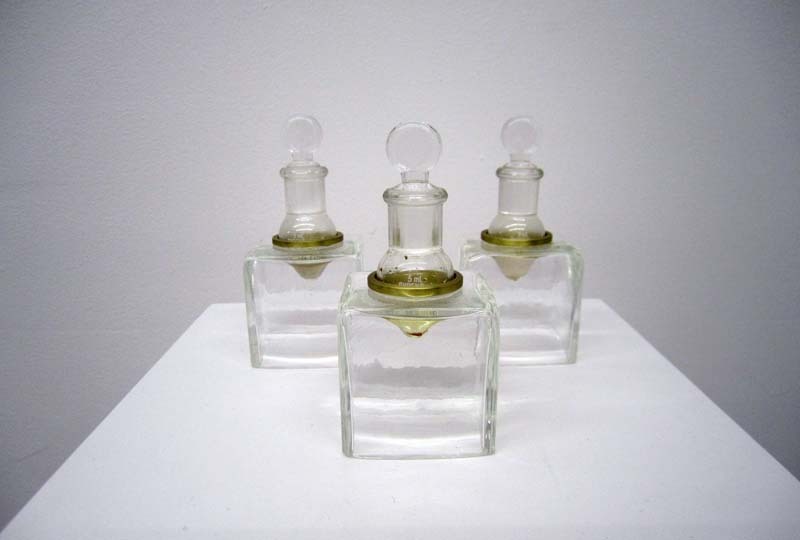 I popped into Envoy Enterprises the other evening, after The Silent History Walking Tour, intrigued by the spare-looking gallery and the title of the exhibited show – Martynka Wawrzyniak: Smell Me. The Polish artist, living in NYC, in essence (no pun intended) created an olfactory self portrait. What exactly is an olfactory self portrait you ask? Working with a research team of Hunter College Chemistry students under the guidance of professor Donna McGregor, Wawrzyniak underwent multiple experiments to collect aromatic elements from her body, and ultimately exhibited them. Partly displayed in elegant perfume bottles/vials that held the scent of her sweat in one, tears in another, nightshirt in a third, and hair essence in the last, while on a separate stand were three candles in beakers titled Martynka Candle #1-3 which were made from paraffin that had been applied and then scraped off of the artist’s body and would emit her scent if burned. If this wasn’t odd enough, there was a type of smell chamber in the back with a little diagram outside, indicating the different scents emanating from holes in the small private room. Presumably the extractions on view outside the room were intermittently sprayed into the chamber one scent at a time, but the result was more of a general unpleasant odor, though I did not react as negatively or extremely as the woman who stepped in right after me and ran out gagging.